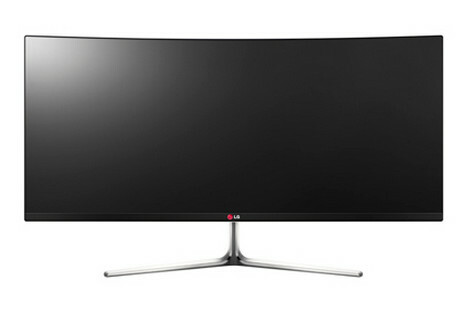 LG Electronics (LG) will be unveiling its newest IPS 21:9 Curved UltraWide Monitor (model 34UC97) and other compelling monitor offerings at IFA 2014 in Berlin, Germany. The world’s first monitor to incorporate a curved IPS screen with a 21:9 aspect ratio, the eye-catching 34-inch monitor provides remarkable picture quality and a range of convenient connectivity options. Also to be introduced at IFA 2014 will be the stunning Digital Cinema 4K Monitor (model 31MU97) and the feature-packed Gaming Monitor (model 24GM77), both combining superior performance with modern style and versatile functionality. LG’s flagship IPS 21:9 Curved UltraWide Monitor is a complete monitor solution, equally suited to the needs of professional users and home entertainment enthusiasts with extra screen real estate so users can get more done in less time. By adding a gentle curve to a 21:9 aspect ratio monitor, LG has created a unique product that delivers a more immersive experience. The Quad HD resolution display with 3440 x 1440 pixels gives digital photographers and filmmakers the level of detail and accuracy that their work demands. Compatible with both PCs and Macs, the LG 34UC97 monitor easily handles heavy graphics and videos with ease on either system and supports Thunderbolt 2 for high-speed data transfers – four times faster than USB 3.0 – and allows multiple devices to be daisy chained together. The monitor also features MAXX AUDIO and 7 W stereo speaker system guaranteed to deliver peak audio performance across all frequencies. In addition to the world’s first 21:9 Curved UltraWide Monitor, LG will be unveiling its Digital Cinema 4K Monitor for the first time at this year’s IFA. LG’s Digital Cinema 4K Monitor meets the Digital Cinema Initiative’s standard for 4K resolution displays, squeezing 4096 x 2160 pixels into a 31-inch screen, for resolution equivalent to four Full HD monitors. The 31MU97 model allows professionals such as movie editors to watch original 4K content the way it was meant to be seen. The Digital Cinema 4K Monitor employs an LG IPS 4K display that provides ultra-sharp images with a wide viewing angle. Able to reproduce 99 percent of the Adobe RGB color space, this monitor is an ideal choice for film professionals as well as for those working in design and photography. The Digital Cinema 4K Monitor comes hardware calibration-ready and also features Dual Color Space and LG’s exclusive True Color Pro calibration software. Gamers will especially appreciate LG’s 24GM77 new Gaming Monitor which is specifically designed to handle the fast-paced action of the latest first person shooters (FPS). A refresh rate of 144 Hz ensures that even the most intense action appears smooth and flicker-free, while LG’s Dynamic Action Sync (DAS) Mode drastically cuts input lag, enabling the player to respond faster to what’s happening on the screen. Other notable features include Black Stabilizer for consistent blacks across different scenes and Game Mode, which offers three optimized settings that can be applied quickly by pressing a hotkey on the monitor, with the option to create customized presets. And Motion 240, developed exclusively for the Gaming Monitor, helps minimize motion blur with a fast response time of less than 1 ms.
LG’s next generation advanced PC monitors will be on display at IFA 2014 in Hall 11.2 of Messe Berlin from September 5-10. How To Retrieve Back Your Lost & Deleted Data?